Is this a belated article? Aleatory responses to the tragedy on the way to the Jamaraat such as Adamu Adamu’s Tears for Haramayn, (Daily Trust of Friday September 25 2015, and October 2 2015), to my mind, will not serve the cause of objectivity and honest analysis of what occurred at the peak of Hajj 2015 operations. Tears for Haramayn is purposeless as Allah has endowed the Haramayn with a succession of dedicated and competent custodians who spare no expense in massively expanding, preserving and maintaining them; who, with erudite verdicts of sincere scholars, will avert any shirkiyyaat-desecration of the Haramayn by religious deviants, and false claimants of faith and love of the Prophet’s household. To begin with, the term ‘stampede’ is wrong and derogatory. A stampede is an act of mass impulse among herd animals or a crowd of people in which the herd (or crowd) collectively begins running with no clear direction or purpose. Academic experts who study crowd movements and crushing disasters oppose the use of the term "stampede". (Benedictus, Leo (October 3, 2015). "Hajj Crush: How Crowd Disasters Happen, and How They Can Be Avoided". The Guardian). Crowd behavioural experts like Anne Templeton argue that calling crowd collapses and crowd crushes stampedes imply that the crowds are animalistic or mindless; and this was not the case. What happened in Minaa is not unique to Minaa; in fact, it has been the subject of much academic studies in Saudi Arabia. They have computer models of potential scenarios that could cause the tragedy. They even have people who have gone to study the phenomenon outside of the kingdom and who returned to head departments responsible for human and vehicular traffic. I will come to why such accidents happen in spite of all these later, inshaa Allah. Genuine tears should be for the martyrs that died in the crush, and the loved ones they left behind. Tears shed, not because the departed died in vain, but for love and care. Their end came to them while they were adorned in their ihraam; at the end of fulfilling one of the pillars of their religion; at the hallowed grounds of Minaa. If a Muhrim (a pilgrim in the state of ihraam) dies, their faces and heads are not covered; they are buried in their ihraam because on the Day of Judgement, they will raise from their graves chanting the talbiyah – Labbayk Allaahumma labbayk - answering Your call, Oh Lord. I waited this long for the clouds of shock and anguish to abate, on the one hand. It also gave room for the political curtain encompassing the crowd crush/collapse to fall, to expose what was concealed behind it of blackmail, deep abhorrence against the Al Sa’ud, thus revealing the ardent desire of a people with Zoroastrian lineage to have control over the administration of the two inviolable places of worship, on the other. I do not think the Saudi government is saintly; far from it. I know they have their faults; that is another matter. I know they can improve on the already very good services they are rendering to the guests of Allah; that is not my point, presently. What galls me, and of which the proponents should be ashamed, is the claim that they were nonchalant and cared little for their fellow Muslims from all over the world. Allah adjures us to be fair even to our mortal enemies. The lies, the liars and the misinformed have grown in number and it is not fair; even against pagans to produce vicious lies and half-truths against a people just to find a reason to demand the handover of the two harams to a deviant sect. Although the Saudi government is very capable of defending itself, nonetheless, it is befitting that we all debunk the specious stories making the rounds on social media and elsewhere about the cause and aftermath of the mishap. I write not as a sedentary critic far away from Saudi Arabia, parroting whatever comes to him from the social media and churning it to unsuspecting readers. I write as a Hajj tour operator who, like numerous other private Hajj organisers and state pilgrim officials, was leading groups of hajjis during this year’s pilgrimage. Our responsibility was to ensure the safety of all pilgrims in our groups from the time they depart Nigeria until they return home after completing their devotions in the holy territories. When disaster strikes leaving death and injury in its trail, therefore, we are worse affected because of the fiduciary duty that we owe our pilgrims. We take responsibility of whatever happens to them for the duration of the package that they paid to our companies. As I write this piece, an interim report on the crowd crush/collapse of the Association of Hajj and Umrah Operators of Nigeria (AHUON) states that a total of 18 pilgrims that travelled through private Hajj companies have died, 25 are missing, while 11 sustained injuries. If you add this to the casualties among the state pilgrim arrangements, you arrive at the figures given by the National Hajj Commission of Nigeria (NAHCON) from its office in Makkah, of the dead from Nigerian pilgrims being 64, with 240 missing, and 75 injured. AHUON’s monitoring team under the leadership of its President, Abdulfattah Abdulmajeed, moved tirelessly from one Saudi hospital to another, identifying bodies and speaking to the injured who survived the crowd crush/collapse. I must state here that the team easily identified pilgrims who died with their identity cards hung on their necks. Unless a relative was close by or somebody who knew the deceased, bodies of pilgrims without identity cards on them were hardly traced to any Hajj group. That is why we constantly adjure our pilgrims to carry, at all times, the identity cards we issue them for the Hajj operation. Another means of identification was the hand band which had certain numbers unique to the Hajj Field Office where the pilgrim’s passport is kept. Some of the bodies had neither identity cards nor hand band on them. On account of AHUON’s findings, what I will present here is at variance with Adamu Adamu’s ‘Many eye-witnesses’ fiction; albeit, my desire is not to exculpate the Saudi Hajj authorities or the government of the Kingdom on what occasioned the crowd crush/collapse either, but to give honest record of events, and support the call for the inclusion of countries affected into the committee investigating the incident, as proposed by the Chairman of NAHCON, Barrister Abdullahi Mukhtar. The multitude left Muzdalifah for the first ritual at Jamaraat in Minaa, though the flood of pilgrims appeared to be at a standstill, people kept moving towards the stoning site. The pilgrims that had already preceded others have finished their stoning rites and were returning from the same direction. Before these were others, who claimed to have been diverted, on their way to stoning, by security personnel, to follow a lane designated for pilgrims who have finished their ritual at Jamaraat, thus the two set of pilgrims collided with each other. Normally, the police and civil defence personnel would be there to enforce taking a different route by such pilgrims. The Jamaraat environment is such that every pilgrim would prefer to return from the route that they come from for the stoning, because it is more convenient and closer to wherever their tents are situated. Taking a different route is longer but safer for all. How these pilgrims were able to retrace their way to the same direction they came from unchallenged by the police, and in the process obstructed the movement of human traffic, could only be made clear by film footage of CCTV cameras that abound in the Jamaraat area. Several eyewitnesses claim that the closure of Street 206 was the main reason behind crowd crush/ collapse in Minaa. The closed eastern part of Street 206 left pilgrims with no choice but to go left through Street 223 and end up meeting the thousands of people coming from the opposite direction of Street 204. The narrow pathway is surrounded by camps and does not lead to other nearby streets. In Mina, over 10 streets are used only for catering purposes and by pilgrims going to and coming from the Jamaraat Bridge. Street 204 links Minaa tents with the Jamaraat Bridge and is used by the pilgrims in camps located on each side of the street. Vehicles are not allowed on the street. It merges into Street 406 running from Muzdalifah, which links Muzdalifah with Mina and Al-Jamaraat Bridge. It is used by pedestrians and buses transporting pilgrims and is 1.5 km away from the Bridge, which was built 11 years ago at a cost of around SAR4.2 billion. Contrary to Adamu Adamu’s fiction, in the last 8 years, no accident has taken place at the bridge or Minaa, even during the time when hundreds of thousands of pilgrims flock to throw pebbles at the same time. This is because the bridge was designed in a way that prevents overcrowding and stampede. It is 950 meters long and 80 meters wide with five 12-meter-high floors as well as 12 entrances and 12 exits. The claim that hundreds have been dying every year must be called what it is; a lie! Street 204 leading to the Jamaraat was filled with pilgrims who were pressing onward the stagnant flood, some carrying infants on their arms, others assisting the aged and the weak on wheelchairs. The heat was intense, about 48 degrees Celsius; exhaustion set in amidst a constricted mass, majority of them had trekked from Arafaat to Muzdalifah and then Minaa. 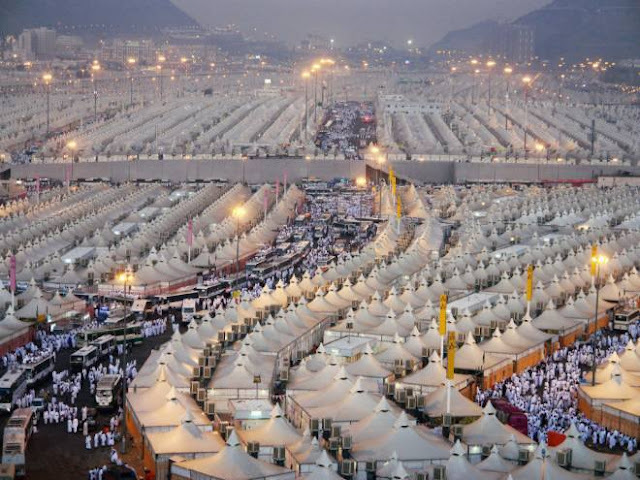 Even at the sight of this impending catastrophe the personnel operating gates of special tents, (these are not Saudi security forces; they are private guards), on either side of street 204 refused to open them to give way to the surging wave of pilgrims. If the gates were opened, some pilgrims could have safely moved into the tents, and thus the constriction in the multitude would have been lightened. Moreover, these private guards at the entrances of the tents refused to give water to their dying brethren who were weakened by severe thirst, sweating profusely. This was quite unusual in Saudi Arabia where people, seeking Allah’s reward, are eager to give sustenance to pilgrims, be it during Ramadan or the Hajj season. The guards were deaf to all entreaties for water. Many victims simply died of dehydration in the sweltering heat. People started gasping for air; ventilation was at its premium. Some climbed over the barricades into safety, while others were trampled, and slowly asphyxiated. It was a mini-Qiyaamah as nakedness of men in the presence of women and vice versa was not an issue. The wheelchairs compounded an already horrendous situation, causing the death of many that could have otherwise been saved. Some pilgrims who climbed over the fence forced the guards of the adjoining tents to open their refrigerators to give water to the dying hajjis. To many, the water came too late to save them. No survivor or eyewitness can relate anything beyond what happened at the epicentre of the crush, just as people who were within the Jamaraat area could only speak concerning what they witnessed there. They knew nothing about the crush except what survivors and eyewitnesses told them. Therefore, survivors who spoke about the closure of roads as the cause of the crush had no justification for saying so, because they could not be at the two scenes at the same time - the epicentre of the crush, and the Jamaraat area. The two places are poles apart! God bless u Sheikh Abubakr Siddique for this authoritative intervention. Unlike our perennial seat-of-the-pants arm chair critic of Hajj and the Saudis, you are indeed an eye and ear witness of the unfortunate mishap. While eagerly awaiting your part two, I would like u to consider commenting on those taking advantage of this unfortunate incidence to advocate for the abrogation of the important pillar of stoning so as to avoid casualties. In fact some heretics are even questioning the restriction of Hajj to just the ten days of Dhul hijja!